My poor husband. Truly there are times where he marvels that our country is so heavily populated. How so many more of us haven’t perished from a spider/box jellyfish/crocodile/shark or snake bite defies logic for him. The fact that we have so many deadly creatures is one thing, but this recent development to him was going way too far. 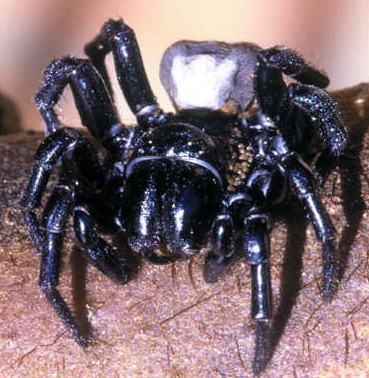 It was announced on the news recently that there was an anti-venom shortage for the funnel web spider bite. For those of you that don’t know, the funnel web spider is the deadliest in the world and is found well, pretty much everywhere people are also found en mass. As you can imagine this creates quite a problem. My (apparently incorrect) assumption was that ‘they’ (being those anti-venom experts) had some kind of breeding center where they bred these nasty beings and milked them for their venom. I’m not suggesting that I’ve come up with some kind of ground breaking solution or anything, but to all those funnel web experts out there, you might want to consider this option in preference to the ‘solution’ (and I use that term loosely), you offered below. It was this segment that I found my husband watching in horrific disbelief. How to catch the worlds deadliest spider – with a cup and a piece of cardboard. Being a good Aussie girl I myself watched this segment with relative disinterest thinking back to all the times my father had searched the yard for these notorious killers when we were kids, pouring mineral turpentine into their holes, lighting a match and throwing it into the hole before walking away in search for his next victim. I never thought much about this, his obvious duty was to protect his family and this was the safest and most efficient way to get the job done. Funnel webs were an unpleasant part of life, but not one that I gave much thought to – until now. I pondered this for a moment and came to the conclusion he was right. That said, I also don’t think too many Americans would choose to play with such a dangerous creature even if the segment were to go to air – unfortunately there is a large population of (mostly) young men here in Australia who seem to be er.. mentally challenged in such areas. That segment essentially endorsed stupid and dangerous behaviour, they would be most happy to comply. This whole ‘population rescue’ that us mothers are supposed to make, is all contingent of course on the fact that we aren’t bitten by this worlds most deadly and notoriously agressive spider in the process! Which, ironically, would require the need of an anti-venom that is already in direly short supply. Is it not enough that we are almost solely responsible for populating the world, and now we’ve been lumped with the responsibility of keeping you all alive as well? Something seems very wrong with this picture if you ask me. I did find a special kind of pleasure in hearing him say in the post script portion of the segment “The one you catch may save your child, mother, friend or relative.” Notably, he neglected to mention that the one you catch could also end up being the one that causes demise of your own being. Gotta love the Australians it’s such a small detail, no need to mention it and get people all all worked up over nothing.